Comfortable and friendly home in an ideal location for visitors to Lewes. We are very close to both the South Downs for lovely walks and the centre of town. Many cafes, pubs and restaurants, antique shops are within 5 minutes walk. One twin ensuite and one double ensuite with separate entrance downstairs. There are no rooms available at 1 GARDEN COTTAGES (left house!) for these dates. Parking: On street parking is available at a charge of £1.00 per day. Parking is available nearby at a charge of £8.00 per day. Compact with everything you need. Warm, clean and well decorated. Even in winter Lewes is a buzzing, picturesque, historical town with lots of independent shops, restaurants and antique stores as well as some of the usual chains. The castle sets the scene. 17 minuets on the train to Brighton, £5 return, regular trains about every ten minuets. A wonderful hideaway in the centre of Lewes from which to explore the town itself and the South Downs. Excellent facilities and very comfortable bed. We had a lovely stay in Garden Cottages! 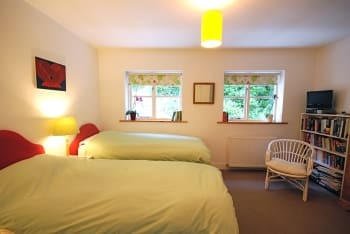 Very pleasant room, such comfortable beds, functional bathroom, really quiet location, most friendly & hospitable welcome; I would always recommend the Garden Cottages to family, friends and colleagues! Try dining in Côte, high up on High St. A very good tip by our host Alison. Alison and Vladimir were very welcoming, attentive to our needs and provided lots of local information. Nice and quiet place, not far from the centre. Fantastic breakfast too! Very nice B&B, comfortable and clean with good breakfasts and very good location. Snowdrop nice pub but be careful of portion sizes - very big! Very friendly. Delicious breakfast. Altogether a lovely stay. We hope to come again! Charleston Farmhouse. Gorgeous garden and fascinating house. Shuttle bus during festival if you don’t have car. A lovely relaxed stay, we loved having our own front door! The bed was super comfy and the breakfast was delicious, couldn't ask for more! Make sure you visit Le Magasin in Lewes for lunch/dinner, really fab restaurant. Allison was very friendly and welcoming! Great breakfast. A lovely quiet room with view of the garden. Modern bathroom and lovely STRONG coffee for breakfast! Thanks, Alison! Here for tha Lewes folk festival for the 2nd year running. Try eating at the Snowdrop Inn just a minute's walk down the road. Extremely warm welcome from Alison. Lovely home in atmospheric street. Very comfortable. Delicious breakfast. Convenient location for exploring the Downs and our particular interest (homes and work of the Bloomsbury Group at Charleston, Monk's House and Berwick Church). The Snowdrop pub, a few yards from the cottage, was excellent for good range of beers, great food and warm atmosphere. We went there twice - no need to search further. A great welcome with plenty of helpful advice on how to make our stay enjoyable. We found the Snowdrop Inn down the road very friendly. 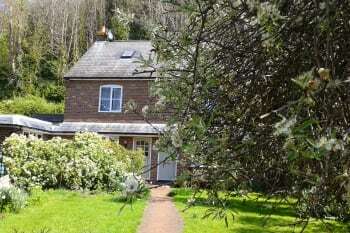 Very quiet but convenient location, surrounded by greenery but just a few minutes from Lewes high street. Friendly welcome, and Alison is very helpful about places to visit and other tips. Excellent scrambled eggs! Decoration in bedroom is a little bit tired but very clean, and very comfortable bed. Le Magasin is an excellent local bistro. We did a lovely coastal walk from Seaford with views of Seven Sisters (thank you to Alison for recommendation! ), and visited Berwick Church for Vanessa Bell and Duncan Grant paintings, and Virginia Woolf's home at Rodmell. Lewes itself is a lovely town with plenty to see there. Very warm welcome. Cozy room, nice breakfast. Only the parking was a bit tricky. Excellent b and b. particularly helpful and attentive hostess. thoroughly recommended. snow drop pub down the rosd is v.good. noidsy in the garden from the by pass, but not overwhelming and food fine. beer excellent. 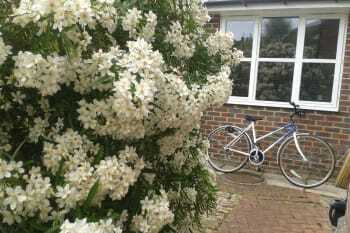 Enjoyed our stay at Garden Cottages, Lewes. Alison made us very welcome. The separate entrance let us have our own space without intruding. The room was tidy and attractive, with a clean bathroom. Great breakfasts everyday. Enjoyed the Rights of Man pub in Lewes. Nice atmosphere and good selection of local Harvey's beers. A lovely place to stay, beautiful garden, nice cottage in picturesque location. Our hostess was very welcoming and helpful. The breakfast was great! Eggs prepared on request, as liked. We would recommend to friends. Walking distance to local restaurants, pubs, the pedestrianised shopping area. Easy reach to lovely Downs walks etc. Our hostess supplied lots of information. First class, everything beautifully organised. Lovely, relaxed atmosphere. Excellent breakfasts. Lovely little B&B, really enjoyed my stay here. Great recommendations on restaurants from Alison. A pretty cottage with a surprisingly modern and spacious interior. The hosts are charming and the breakfast was excellent. Excellent position for those walking the South Downs Way. Easy communication before arrival and a lovely welcome. A very comfortable stay after a long ride and a perfect breakfast to set us on our way again! We liked The Pelham Arms pub and The Lansdown Arms pub. The castle is fantastic. Just stroll around the streets and you will see everything you need to! Easy to book online. Quiet and clean, lovely garden, nice breakfast and copacetic hostess. Very central in Lewes, so parking is a bit of a problem, but there are spaces to be found in South Street and surrounding lanes. Very pleasant stay with nice people would certainly recommend. Great location for central lewes and the Sussex downs. Host couldn't have been more helpful as we arrived soaked by torrential rain. Comfortable, clean, warm and friendly. The cottage was very central to the town, just what we needed. We felt very relaxed and comfortable staying there. It was a lovely home. I thought the parking would be a problem, but we managed to get a space each time. A very happy stay. Wonderfully friendly, helpful welcome to an immaculately kept house. Very comfy beds, spacious rooms and bathrooms, breakfast cooked to order, fresh fruits, cereals, lovely granary toast and good coffee. Felt like staying with friends and so convenient for all the facilities of Lewes. Pub "The Snowdrop" just further along South Street was excellent, full of character, great choice of beers and friendly welcome. Ate at Le Magasin bistro about 5mins walk away - excellent, can recommend. Great location. Clean, good sized room. Great breakfast options. Quiet. Friendly and helpful hosts. Nice quiet location but close to town centre. Friendly welcome. We enjoyed are stay. We tried the Bills and The Limetree Kitchen. Both good. Friendly, quiet and reasonably priced accommodation in heart of Lewes. Delightful small b&b, relaxed and friendly. Situated in a quiet location, but only a few minutes from shops etc. Lewes is a charming small town with good rail links. Plenty of restaurants and pubs, interesting independent shops. Good walking routes from town, many other Sussex attractions nearby. Traffic in the area can be heavy, especially in summer. Lewis is a lovely town and Garden Cottages is just around the corner from the High Street where you will find restaurants and cafes and a variety of interesting and unusual shops. A short walk away is the castle. Nice comfortable and peaceful B&B in the heart of town. Ate at Bill's, a short walk away.